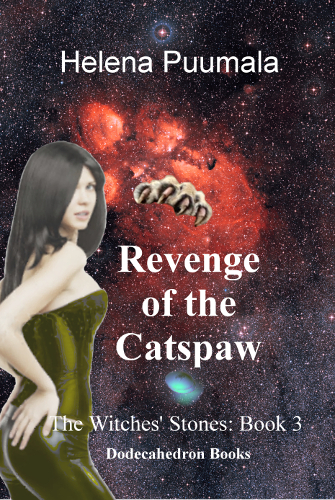 This week, Oct 31 to Nov 4 2018, “The Witches’ Stones Book 3: Revenge of the Catspaw” is free on Amazon. So, go on a free romantic science fiction adventure with Terran Confederation agents Sarah Mackenzie and Coryn Leigh as they attack their enemy head-on, on its home planet, in order to preserve the peace of the galaxy and their own romantic relationship. In this, the third and final book of The Witches' Stones saga, the attractive part human-part Kordean Witch psychic Sarah Mackenzie and the handsome Terran Confederation agent Coryn Leigh face some profound dangers and challenges, some personal and some that span the galaxy. The novel is about 115,000 words, about 8 to 10 hours reading at typical reading speeds. It is the final book of the trilogy, at least for now, although writer Helena Puumala has “kept the door open” to perhaps pursue new adventures in Sarah and Coryn's universe at a later date.